Toward the end of 2018, just 42 percent of U.S. electrical distributors offered their customers an e-commerce experience. That’s according to a surprising study from credit management platform Apruve, which released a report comparing e-commerce in the electrical supply industry. Providers that operate e-commerce sites tended to be larger and more established — again, a surprise, when the narrative of scrappy, tech-savvy startups dominates so many other industries. So what’s holding back small and medium-sized providers of electrical products? 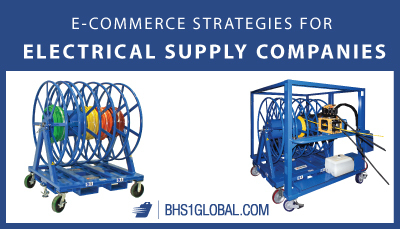 There’s no blueprint for selling online in a B2B capacity, into which category electrical distributors certainly fall. Add to that a perceived high cost of entry into the online space, and you end up with whole segments of a large industry stuck in between old models and the buying patterns of the future. E-commerce is not all-or-nothing. Think omnichannel; keep your current business just as it is, and add the online dimension to reach a whole new set of customers. Stand out from the behemoths in the online sales space by offering true expertise, strong customer support, and value-added services larger sellers don’t have time for. For instance, offer custom cutting, paralleling, twisting, lashing, dyeing, and striping services at no extra charge. Online sellers who offer electrical supplies as one department among many won’t be able to compete with these valuable services. Choose bulk material handling equipment that will allow you to operate multiple sales channels from your existing warehouse. Compact storage and efficient payout for cable is crucial for a true omnichannel approach — unless you want to operate multiple distribution centers, that is. Invest in Parallel Reel Payouts and a Spool Winding Trolley to store bulk loads of cable and quickly transfer them onto delivery reels. At the time of this writing, the economy was strong, and many electrical distributors were making decent profits. It’s an ideal time to move into the online space. Better to invest when the funds are available than to react at a point of crisis, when success in the new e-commerce venture could become a make-or-break endeavor. It may be tempting to think things like, “Our customers don’t buy online. They’re old-school electricians, and they prefer our brick-and-mortar experience.” Don’t believe it. The data tell a different story. TED, the Electrical Distributor Magazine, describes a survey of 1,500 electricians and other electrical professionals. Among them, nearly 70 percent said they bought some or all of their business-critical supplies online. Another study, TED points out, found that 73 percent of B2B buyers would rather order online, off of a website, instead of interacting personally with a sales professional. The fact is your customers are already online. If you don’t meet them there, it’s all too easy to find an electrical supplier who will. Brohan, Mark. “Many electrical distributors remain off the grid for e-commerce.” DigitalCommerce360. Vertical Web Media LLC, 3 Oct. 2018. Web. 22 Oct. 2018. McCrea, Bridget. “E-Commerce: Invest Now or Pay the Price Later.” TEDMag. The Electrical Distributor Magazine, 29 Nov. 2017. Web. 22 Oct. 2018.